8am - For a few months, we have been thinking about how it would be to fulltime in Scampy. We want to get out of Apple Valley and go roaming around again. Like we did during our MsTioga years [2003 - 2014]. You're not going to be happy in the desert when summer arrives. This would be the time to give Scampy a try for 3-5 months. My thought are the same about summer. Each time you return to Twayler after a Scampy trip, you seem awwwwfully glad to be back at Twayler! Just sayin'! I am glad to live in Twayler. But I am also glad to go off in Scampy! Your last trip to Jojoba seemed to be unsettling...was it because the wait time will be much longer than anticipated? You are correct. I was unsettled. Because I was there and would have to leave Jojoba. Better that I don't visit Jojoba until I am at the top of the wait list. Come to Northern WI. Summer is fairly cool and you can camp on a different lake every day! ( 1200 in my county alone ) Plus you havent lived till you try a Wisconsin Friday night Perch and Walleye fish-fry. I have never driven an RV as far east as Wisconsin. Would you keep or sell Twayler? Still committed to Jojoba? When I am off in Scampy, Twayler will be in the storage lot at Lone Wolf. I am committed to Jojoba! I think you have a nice piece of time on your hands. Fultiming until you are in at Jojoba would be a great idea. Perhaps a big huge circular route? Also a great time to see what you haven't seen before. Like music? How about going to any music festivals. When MsTioga and I were together, around April we would come north out of Mexico and up thru Utah to Montana. Following T-shirt and short pants weather! Death sentence is a bit harsh a sentiment for me. But definitely a downer to not be traveling! For me Scampy would be too small. Keep in mind the difference between Tioga and Scampy in size plus I think a motorhome is easier to drive and park. Think hard before making decisions that cannot be reversed. A trial would be great. Good luck. I've had a trial when I travelled to the San Diego area earlier in the year and camped in Scampy. This decision to go off in Scampy could easily be reversed. All that I'd have to do is to return to Lone Wolf. For me it would be a no brainer -- I would certainly full time in Scampy. Well..... I am going to do it! 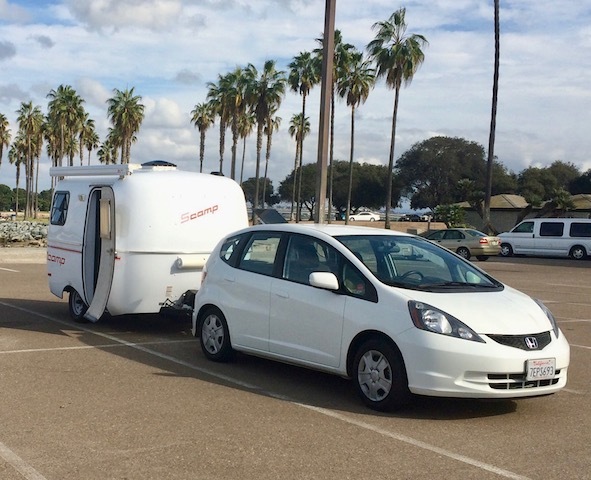 Camping in Scampy is just about as simple as RVing gets. George, reading your blog for so many years now, I've seen you get an idea and all seems good at first then in the end, maybe it wasn't so good. Remember when you were wanting to purchase land in Mexico? It was probably good that it didn't work out. In the future, you may very well need Twayler as a home base. If you need a walker, etc., you will have more room. Also, if you ever need a caregiver, you will have the room. The idea to buy land in Mexico was not a good idea. And you would not have known about that idea if I were not so very open in my blogging to you. I am NOT getting rid of Twayler. Only storing Twayler at Lone Wolf while I am off RVing in Scampy. When I get to the top of the Jojoba wait list, Twayler will move to Jojoba and be my home there. Sorry George, I misread your post. I thought you wanted to full-time with Scampy and sell Twayler. No need to rush into anything without the option of turning back. Head out full-timing for a month or two and evaluate your situation at that point to determine if you want to continue or return to home base at Lone Wolf for a spell. You have the best of both worlds at your disposal. George, When I had a heart attack ten years ago Nancy and I thought it would be the best to buy a park model which we did. Stayed in that thing for seven years during that time we traveled six months in the motorhome and never was satisfied. So three years ago sold the park model and back in the motorhome full time. I'm a happy camper now. Just saying easy to go back to twayler for you. Wildflower explosion anticipated in Borrego Springs next week! Lots of desert to park in all around the area!